Over the past month, about a half dozen rather large asteroids have careened nearby our home planet and in one case caused significant injury and property damage with no forewarning – showcasing the hidden lurking dangers from lackluster attitudes towards Asteroid Detection & Planetary Defense. Now in a prescient coincidence of timing, NASA is funding an experimental asteroid radar detection array called ‘KaBOOM’ that may one day help thwart Earth’s untimely Ka-boom – and which I inspected first-hand this past week at the Kennedy Space Center (KSC),following the SpaceX Falcon 9 blastoff for the ISS. “KaBOOM takes evolutionary steps towards a revolutionary capability,” said Dr. Barry Geldzahler, KaBOOM Chief Scientist of NASA Headquarters, in an exclusive interview with Universe Today. If successful, KaBOOM will serve as a prelude to a US National Radar Facility and help contribute to an eventual Near Earth Object (NEO) Planetary Defense System to avert Earth’s demise. First some background – This weekend a space rock the size of a city block whizzed past Earth at a distance of just 2.5 times the distance to our Moon. The asteroid – dubbed 2013 ET – is noteworthy because it went completely undetected until a few days beforehand on March 3 and measures about 460 feet (140 meters) in diameter. 2013 ET follows close on the heels of the Feb. 15 Russian meteor that exploded violently with no prior warning and injured over 1200 people on the same day as Asteroid 2012 DA 14 zoomed past Earth barely 17,000 miles above the surface – scarcely a whisker astronomically speaking. Had any of these chunky asteroids actually impacted cities or other populated areas, the death toll and devastation would have been absolutely catastrophic – potentially hundreds of billions of dollars ! Taken together, this rash of uncomfortably close asteroid flybys is a wake-up call for a significantly improved asteroid detection and early warning system. KaBOOM takes a key step along the path to those asteroid warning goals. ‘KaBOOM’ – the acronym stands for ‘Ka-Band Objects Observation and Monitoring Project’ – is a new test bed demonstration radar array aimed at developing the techniques required for tracking and characterizing Near Earth Objects (NEO’s) at much further distances and far higher resolution than currently available. “The purpose of KaBOOM is to be a ‘proof of concept’ using coherent uplink arraying of three widely spaced antennas at a high frequency; Ka band- 30 GHz,” KaBOOM Chief Scientist Geldzahler told me. 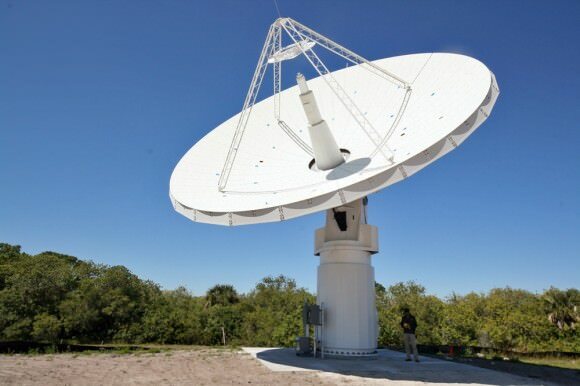 Currently the KaBOOM array consists of a trio of 12 meter wide radar antennas spaced 60 meters apart – whose installation was just completed in late February at a remote site at KSC near an alligator infested swamp. Miller showed how the dish antennae’s are movable and can be easily slewed to different directions as desired. “The KaBOOM concept is similar to that of normal phased arrays, but in this case, instead of the antenna elements being separated by ~ 1 wavelength [1 cm], they are separated by ~ 6000 wavelengths. In addition, we want to correct for the atmospheric twinkling in real time,” Geldzahler told me. Why are big antennae’s needed? Such physical characterization data would be absolutely invaluable in determining the forces required for implementing an asteroid deflection strategy in case the urgent need arises. How does KaBOOM compare with and improve upon existing NEO radars in terms of distance and resolution? “In the end, we want a high power, high resolution radar system,” Geldzahler explained. Thumbs Up for Science & Planetary Defense ! Another significant advantage compared to Goldstone, is that the Ka radar array would be dedicated 24/7 to tracking and characterizing NEO’s and orbital debris, explained Miller. Goldstone is only available about 2 to 3% of the time since it’s heavily involved in numerous other applications including deep space planetary missions like Curiosity, Cassini, Deep Impact, Voyager, etc. ‘Time is precious’ at Goldstone – which communicates with some 100 spacecraft per day, says Miller. “If/when the proof of concept is successful, then we can envision an array of many more elements that will enable us to reach the goal of tracking asteroids farther out than we can today,” Geldzahler elaborated. A high power, high resolution radar system can determine the NEO orbits about 100,000 times more precisely than can be done optically. So – what are the implications for Planetary Defense ? “If we were to find that a NEO might hit the Earth, NASA and others are exploring ways of mitigating the potential danger,” Geldzahler told me. Kaboom’s ‘First light’ is on schedule for late March 2013. I see that “absolutely catastrophic” is defined as “potentially hundreds of billions of dollars!” All that money lost when millions are killed would be a real fiscal tragedy for sure, and the dip in the work force and consumer confidence could affect economies for years to come, that’s why we need this space defence, yessiree. I’m curious how this system contrasts with the proposed space telescope that the B612 Foundation wants to build and launch. I wonder we do not have such a system already operating world-wide! It’d be good to locate and activate any and all possible resources for monitoring the sky. Am thinking old telephony *.sat tracking arrays, defunct military resources or something like a citizen scientist version similar to the Allen Telescope Array antenna farm… Any billionaires out there with an itch to save humanity? We need to put “monies” into “Research & Development”=(R&D) for space weather etc.. . We need R&D w/special new optic to’see’ the faintest of faint objects out there. We need more ‘sats’ for earth & space weather. We need new sats in all areas of space to correctly be up-to-date w/techno savvy. We need R&D to deflect any & all in coming objects. I’d rather see the money go for more sats rather than funding the LHC for the ‘Higgs’ right now. That can wait for now until we can be up to date w/sats..
China, Russia, Japan & other country’s need to kick in cash for scientific R&D. Collage’s & University’s all need to get the best & brightest high school students to bolster their R&D scientific studies. I had hand in SOHO R&D and I still have a minor role to this day. It is paying off ‘huge dividends’ of the understandings of “Ole Man Sol”. We are vulnerable in many areas. This lack of concern is scary. Our Eden Earth is a miracle in itself. God Bless us all. Actually, 2013 ET was not all that remarkable. At 2.5 LD, it was not especially close. And it is quite common for asteroids like 2013 ET to pass as close or closer without being detected until just a few days, or even a few hours, before closest approach. In fact, in many cases they are not detected until just AFTER closest approach! Nevertheless, we need a much better method of detecting NEOs than what we have now. Space-based assets, like NEOWISE and B-612’s proposed Sentinel spacecraft would be most productive. But dedicated radar systems, such as Ka-BOOM, are essential as well. Of course, detecting them is one thing; deflecting them is another. But that’s another discussion. I agree. But the air-burst over head in Russia last week or so ago, was both an NEO & a atmosphere hit. It was a small direct hit/air-burst, yes. If that was a Tunguska air-burst event, it would of pulverized “ANY CITY” w/deaths & injuries galore. An iron meteor the size of a mid sized car, depending on the angle of trajectory is down right even scarier. And yes, I am getting ahead of myself here w/scenario’s. My major concern is the somewhat complacent nature of the NEO’s w/the government. Thanks for the new (to me) word, slewed, I had to look it up. Question: Wouldn’t millions of people dying be more important than a cost of hundreds of billions? KABOOM working in conjunction with B612 sounds good, what will we do with all that information? I am lost w/both. Slewed? One life is priceless vs any amount. Lost in translation. No clue where I said slewed. And if I did…ever hear or seen TYPE O’s? Have another double or I should…lol. oh…lol. Right over my dumb head. Been a long day my friend. Take care ;-)… . My understanding is that KaBOOM only tracks asteroids AFTER you have detected them. That is important in working out if they will hit the earth, But doesn’t do anything to solve the problem of only knowing about them just before they hit. We need better ways of detecting new NEOS. NEOWISE only ran while the WISE telescope had coolant . We need a number of permanent NEOWISE type satellites giving continuous coverage of the whole sky. The ATLAS system should come online in 2015. It’s not perfect and won’t capture anything below 45-50 meters but it should give about a one week warning for anything roughly 45 meter in diameter. And 3 weeks for a 140 meter near Earth object. That hopefully will cover asteroids and comets that could cause regional damage and loss of life but not local damage like the Russian meteor. And while watching, we can arrange big barbeques and fry sausages in the sky. 30 GHz = yummy! Cheers! Now thats the spirit! I’ll have a burger, sausage works on both & a cold one! 30gigs sounds great!! Woman a must!